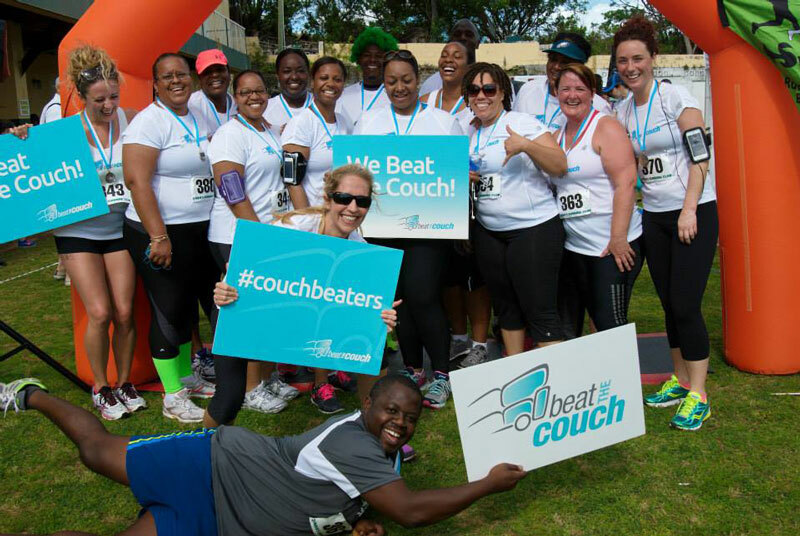 Beat the Couch is back, launching recruitment for Season 6 with a competition for a prize package valued at $800. The lucky winner will receive a free spot on the program, a new pair of running shoes from Sportseller, a one-to-one nutrition consultation with Catherine Burns and a treatment at Ani’s Nail & Beauty Lounge after race day. Applicants must be resident in Bermuda and able to participate in training between 1st October and December 13th. The competition is open to everyone over the age of 18, both male and female. To enter, applicants need to email a picture of themselves to Catherine Burns at Catherine@natural.bm holding a sign that says “I want to be a ‪#‎couchbeater‬ because…..” [fill in the blank!] The deadline is midnight on Friday 25th September 2015. Candidates will then be shortlisted and posted to the Natural Ltd Facebook page [Nutrifit and Natural Nutrition Bermuda] for the public vote over the weekend. The winner will be announced on Monday morning. Season 5 #couchbeaters joking around at the finish line on race day. Over 220 people have participated in Beat the Couch so far, from all walks of life and of all ages. Catherine Burns [Nutritional Therapist and Managing Director of Natural Ltd] said, “We are back this fall with our well-loved trainers Sergio White and Xande Frith, with the addition of a trainer from Court House too. Together they have an amazing set of skills and we are all really excited about the upcoming Season! For complete details regarding Season 6, please go to natural.bm/sport/ . You can also reach Catherine Burns directly on 5054725. Competition details are listed on Facebook at Facebook.com/nutrifitandnaturalnutritionbermuda .